Gianfranco Lotti and Florence belong together. Arts, crafts and Florence give the brand its authenticity, its credibility and its savoir-faire. The brand has the intention to create perfection – beyond luxury and through generations. 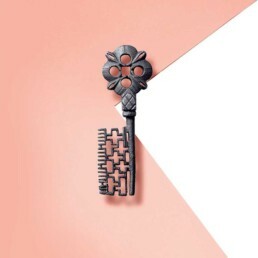 The Keylock is the symbol featured on Gianfranco Lotti’s bags and products and is a signature of all the collections. It casts back to an ancient emblem of the Medici family in Florence. The Keylock materializes the immaterial link between the ancient art of craft, the respect of the heritage and the openness to the future. This tension emphasizes the innovation craft, the spirit of perfection as well as the rarity that make the Gianfranco Lotti brand desirable. The Keylock highlights the desire given by a handbag of Gianfranco Lotti in which secrets can be hidden. UNLOCK THE SECRET OF A POWERFUL SYMBOL, OPEN YOUR HEART TO THE SOUL OF LEATHER.